First, let me state I have never heard of Mr. Threlkeld, so I don't have any history to draw from - however according to this Bloomberg piece. ...Threlkeld, who first got the world’s attention in 1996 when he showed that hoarding by Sumitomo Corp.’s Yasuo Hamanaka would lead to a collapse. ... Threlkeld, who has traded the market for more than 40 years. Why does copper matter? For newer readers copper is so heavily used in the industrial / construction world it is called the PhD of metals (i.e. 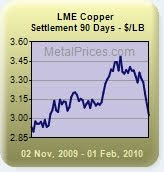 "Doctor Copper") Traditionally, when copper prices surge that is a good foreshadow of strengthening economies. However as we mentioned above we've seen 2 major changes over the past half decade (not just in copper but in all commodities). #2 China as the world's marginal buyer. [May 13, 2009: Commodities - It's China's World: We Just Live in It] When China wants to buy iron ore - dry bulk shipping rates jump. When China wants copper - prices sing up. When China wants (insert commodity of your choice) - price of ABC surges. So does that signal anything about the health of the world markets? No, it just says China wants to buy this week, or month. These have been themes of mine for a long time, but the market clings to old school ways - hence I find it interesting to see a 40 year veteran who has more knowledge in his pinkie than I do about commodity markets, agreeing. Specific to copper I have watched in awe as prices rise even as inventories in London (a closely watched figure) rise to 5 year highs. And no it's not all due to the "weak dollar" just as the surge in oil in 2007/2008 was not all due to "2.5 Billion Chindians". Think about that - does that fit the laws of supply and demand? Economics 101 trumped by innovation? Prices jumping as inventories increase? That's not exactly how it worked for a few thousand years prior to "innovations". We can make the same argument for many commodities including oil. The world is in awash in black crude yet the price has doubled in a year. Why exactly? We literally have investment banks buying oil and storing them in tankers in the middle of the ocean ("financial innovation") to keep inventory off the market. But there certainly is no lack of oil. I could repeat the same situation in many markets.. Here is another reason I believe I am correct on the impact of both China and speculators... it's my own theory. The majority of "soft commodities" - especially the ones that can spoil i.e. wheat, corn, soybeans - have not surged in price during this rally. Instead its been almost entirely "hard commodities". What's the difference? You can stockpile the latter - but not the former. Coincidence? I think not... those commodities most open to "financial innovation" over intermediate to long periods of time [obviously even wheat, corn, et al could be manipulated by hot money for short periods of time], plus China building warehouses to to house every commodity on Earth are the big movers up. Whereas those commodities which will spoil over time - have not. Then again I live on a grassy knoll and could just be making random associations; perhaps Mr. Threlkeld has joines us detaching from the Matrix. Copper prices, which more than doubled last year, are set to plunge as speculators unwind positions and global inventories expand, according to David Threlkeld, president of metals trader Resolved Inc.
“We’re going to see a catastrophe in the market,” said Threlkeld, who first got the world’s attention in 1996 when he showed that hoarding by Sumitomo Corp.’s Yasuo Hamanaka would lead to a collapse. Prices may slump to less than $1 a pound, he said by phone. That about 67 percent less than today’s levels. Some 90 percent of buying “has been from speculators,” (sounds like a healthy, function market based on supply & demand to me! Well supply & demand of Ben Bernanke's printing of US dollars at least) said Threlkeld, who has traded the market for more than 40 years. “Whether they are exchange-traded fund speculators or China pig farmer speculators it doesn’t really matter, because that buying is going to come back to the market,” he said from Arizona. There are about 3 million tons of unreported inventories in China, said Threlkeld. (curious how he came to that figure) The forecast for a slump to less than $1 a pound -- equivalent to $2,205 a ton -- may be driven by higher interest rates in China and the U.S., he said. The prediction reiterates an earlier call and didn’t come with a timeframe. “Three million tons seems a bit excessive, given that that’s more than half of China’s total consumption last year,” said Li Rong, chief analyst at Great Wall Futures Co. China’s copper consumption was about 5 million tons in 2009, he said. “The way the figures are being reported is anything that’s shipped to China is assumed to be consumed, which is clearly ridiculous,” Threlkeld said. Stockpiles monitored by the Shanghai Futures Exchange totaled 101,210 tons last week, more than three times the level a year ago. “What we have now is we have a unique situation, whereby we have a surplus and production has gone up and consumption has gone down,” he said. By "unique" he means, it is clearly nonsense and the laws of Economics have somehow been destroyed in the commodity markets. Output exceeded demand by 191,000 tons in the 11 months to November 2009, the World Bureau of Metal Statistics said on Jan. 20. Inventories monitored by the London Metal Exchange grew about 48 percent last year. If you are unfamiliar with the now infamous "Chinese pig farmers are stockpiling copper" story - see here. Copper is apparently the poor man's version of gold/silver. Private investors in China, the world’s largest metals user, have stockpiled “substantial” quantities of copper as the government ramps up stimulus spending to spur the economy, according to Sucden Financial Ltd. Pig farmers and other speculators may have amassed more than 50,000 metric tons. “People who have nothing at all to do with the copper trade have been buying copper as a store of value, much like they would with gold,” said Jiang Mingjun, an analyst at Shanghai Oriental Futures Co. Does any of this matter today? Nope. In the markets, it only matters when it matters - and then it tends to matter in a hurry.